If you can’t find the answer you’re looking for, please contact our customer care team. In the US, jumpers must be 18 years or older - NO EXCEPTIONS! Minimum age requirements are due to the fact that minors are not able to sign legal documents and parents and/or legal guardians are not allowed by law to sign the rights of a minor away. You will be asked to provide ID with your date of birth when you check in for your reservation. TIP: Be cautious of skydiving centers that allow minors to skydive, even with parental consent. Yes. The most important factor is that your height and weight are proportionate, to allow for proper fit of the equipment. All things proportionate, you must weigh no more than 240 pounds (108kg). Weight limits are strictly enforced and everyone is weighed prior to jumping. Every parachute system has a maximum weight it is rated to carry in order to function properly and safely. CSC uses the best tandem skydiving equipment available and adheres to all manufacturer recommendations for use. 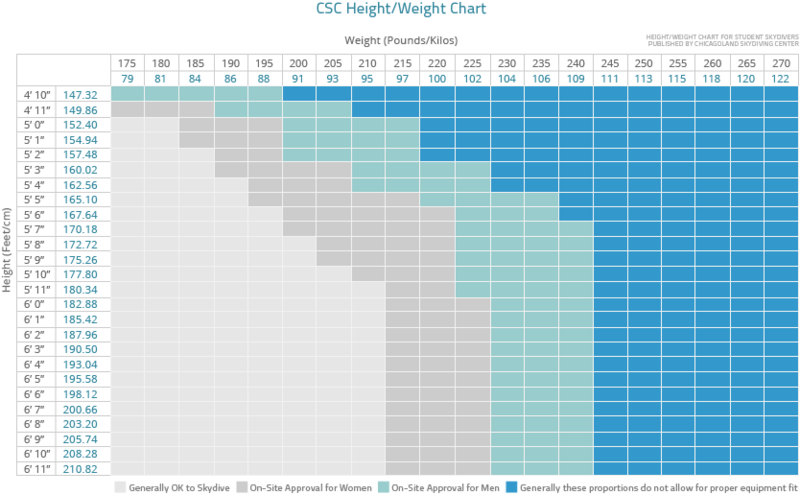 Proportionate body type means your weight is more or less evenly distributed throughout your body. Please reference the chart to see where you fit. If you have questions for your specific case, please contact our customer care team before making your reservation. Read our blog: Why is there a skydiving weight limit? To become a skydiving instructor, a jumper must meet qualifications for a number of completed jumps, a number of years in the sport and go through an instructor training program. Tandem instructors must earn ratings from both the United States Parachute Association as well as the manufacturer of the gear they will be using to complete tandem jumps. Solo skydiving (AFF) instructors must earn ratings from both the United States Parachute Association and receive training for the specific types of aircraft and gear used for jumps with their students. At CSC, we do not hire anyone who simply meets the minimum qualifications. Our staff has years of experience, and must have a proven track record of safety and skill. Skydivers training to earn instructional ratings are mentored by our current staff long before they begin the process of becoming an instructor. We have many loyal staff members who return year after year, which is not common in our industry. It speaks to our safety standards and professional business practices. We are able to recruit some of the best jumpers in the world to work at CSC. Our instructors have made thousands of jumps and received extensive training. Some members of our staff have made well over 15,000 skydives. Tandem skydiving is the safest method for first-time jumpers to participate in the sport. Like any other extreme activity, there is an inherent risk in participation in skydiving. But, statistically speaking, the most dangerous part of your day is the time you spend driving your car. We are proud of our perfect student safety record and take every precaution before, during and after your skydive to keep you out of harm's way. Chicagoland Skydiving Center only uses modern gear and chooses to purchase the best skydiving equipment available on the market. All of the equipment used at CSC is serviced and maintained by FAA certified riggers of the highest ratings. The parachutes are packed by professionals who inspect the gear before every jump. Your instructor will also visually inspect the gear before your jump. Every 25 jumps, the rigs are inspected thoroughly by our FAA master parachute rigger. Every 180 days, the reserve parachute gets inspected and repacked whether it gets used or not. CSC maintains high standards for inspections, maintenance and repairs to our aircraft. Our pilots, instructors and videographers all hold the proper licenses and ratings for the services they provide our guests. Our staff participates in ongoing skill building and training. We have a zero tolerance policy for reckless behavior on our dropzone. For more information and statistics, read our blog "Is Skydiving Safe?" All of Chicagoland Skydiving Center's rigs are equipped with an Automatic Activation Device (AAD). This device constantly measures your speed and altitude during a skydive and -- if you are going too fast, too low -- it will deploy a parachute for you. What happens if the parachute doesn't open on a skydive? Every skydiving rig is equipped with both a main and a reserve parachute. As a tandem skydiving student, you are attached to a trained professional who knows how to handle a malfunction and deploy the reserve parachute if it's necessary. While you may have heard stories about parachutes failing to open, that phrase is often a misguided summary of an incident used by the media who are unfamiliar with how parachutes actually function. It is true that sometimes a parachute can encounter a problem during deployment or flight making it unsuitable for a safe landing, but that's why there's a backup plan! Some parachute malfunctions are minor problems and can be corrected quickly for a safe landing. Others cannot be fixed in time for landing, so the reserve parachute is used instead. Your instructor is trained to recognize these situations and make an immediate decision. Remember, you are connected and you're in this together, so your instructor has a vested interest in completing the jump safely. Freefall University students training to earn a license are taught how to deploy the main parachute at the correct time and how to recognize what a malfunction looks like. Extensive instruction for how to handle the malfunction or deploy the reserve parachute in a timely manner is part of the ground school training before the student's first jump without a tandem instructor. We won't lie to you, it's a remote possibility, and should it occur, you'll probably get to spend the rest of your life skydiving. Statistically, you have a better chance of being struck by lightning or winning millions in the Lotto. The length of a jump depends a lot on type of aircraft, exit altitude, body weight and surface area. TIP: When deciding where you want to skydive, you should ask the dropzone how long the airplane ride will take and what altitude you will jump from. You could be paying the same price to sit in a plane for 30 minutes and jump out at 10,000ft or jump at CSC and be in the plane 15 minutes and jump from 14,000ft. You should get every bit of altitude you pay for! Do I have to jump by myself on my first skydive? No. You will be securely attached to a tandem instructor during the jump. That person is there every step of the way to guide you through the process and introduce you to the sport with hands-on professional guidance. Yes! Some people tend to hold their breath when they feel nervous or get a sudden rush of adrenaline. You just have to remember to inhale and exhale, the air is all around you. Sometimes we tell students to scream if they feel like they can't breathe. This action forces you to exhale and then inhale again when you're done. Then you can go back to smiling. No, it doesn't hurt. The harness is adjusted to you before your jump and tightened so that there's no real shock from it pulling when the parachute opens. Grab your belt and pull your pants up. It's about like that. It's too loud to carry on a conversation, but not loud enough that you have to wear earplugs in freefall. You may be able to hear screams, but that's about it. Once the parachute opens, it's actually pretty quiet, with the sound of a light breeze. You will be able to speak in a normal voice with your instructor while flying the canopy. Can I get video or photos of my skydive? Yes. HD Video and high resolution digital still photography are available for any skydive at CSC. How do you record videos or take photos on a skydive? If you choose to purchase a multimedia package, a professional aerial photographer goes along on your skydive with you and your instructor. They have a special helmet set up with a video camera and DSLR camera with a remote shutter switch controlled by the mouth. The photographer flies along with you throughout your freefall and films your canopy deployment, then meets you on the ground to film your landing. If you choose the Ultimate HD Video Package, you will also have footage from freefall and under the parachute recorded by a sports camera mounted on the wrist of your instructor. Can I bring my GoPro on my tandem skydive? 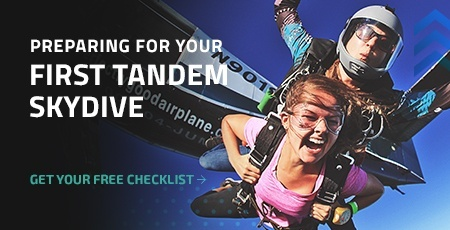 When you make a tandem skydive, you are considered a student skydiver. Per the rules of the United States Parachute Association, student skydivers cannot jump with any kind of video or photography equipment. For the safety of you and your instructor, unlicensed skydivers will not be permitted to bring along a camera, even a small format sports camera. Your instructor or videographer may use these tools to record your jump for you. Be assured that these are professional skydivers trained to use these cameras while also maintaining the proper safety procedures during a skydive. A good deal of acrophobia has to do with relativity. No, not what Einstein talked about. But seeing objects moving in relation to one another. At 14,000 feet, the ground is a long way away and you can't really tell that you're above anything. It looks more like a picture than something you can fall onto. It's very different from climbing a ladder where you can see objects near you and gauge your distance from them. Shortly after the plane takes off, the feeling goes away for most people. Think about it this way, if you stood on the side of the highway and watched cars rush by at 80 miles per hour, everything would seem really fast and you would feel fear about the immediate threat of impact. But if you stood on a mountain a few miles away and looked at the very same spot on the very same highway, the cars would appear to be moving much slower and you wouldn't feel the same fear. That's relativity. It's human nature to feel some fear, and you know better than anyone what you can handle. But most people who claim to fear heights don't have trouble with skydiving. Does skydiving feel like falling? Not really. The feeling of leaving the plane is similar to when you've just jumped on a trampoline and you're in mid air, starting to descend back down. It only takes a few seconds after leaving the plane for you body to reach terminal velocity. After that, it feels more like moving down a cushion of air. You can feel the pressure of the wind on your body. Next time you're riding in a car, stick your hand out the window. You can feel some pressure of the wind hitting your hand. If the car moves faster, there's more pressure. The same concept applies during a skydive. No. That "stomach drop" feeling you get on a roller coaster comes from accelerating from no movement at the top of a hill to building up the speed. If you feel it on the turns as well, those are the G forces from swinging around the curve at a high speed. On a skydive, you aren't starting from a standing still point. You're leaving an aircraft traveling approximately 85 miles per hour. It takes a few seconds for you to build up enough speed to reach terminal velocity, but it's a steady increase in your speed, not a sudden drop out of the plane. Some people who struggle with motion sickness have said doing aggressive turns under the parachute can give them a queasy feeling. If you think you may be sick, ask your instructor to avoid unnecessary turns or spiraling the canopy. We are happy to accommodate your request by making fewer turns and doing them gently. What is CSC's rescheduling and refund policy? Tandem reservation deposit is non-refundable and valid for one year from original appointment date. Paid in full reservations may reschedule with minimum 48 hours notice with no change fee. If CSC must reschedule your appointment due to weather, your jump price is valid for one year from original appointment date. Guests who wait longer than one year to use jump reservation will be responsible for any difference in cost for the current retail price of their booked service. When are skydiving appointments available? Chicagoland Skydiving Center is open April thru November. Please see our Contact page for current hours. We have both weekday and weekend times available. You can make a skydiving appointment online anytime. There, you will see a calendar of all available days and times. Does CSC offer any ground transportation? Yes. Seats in one of our Skydive Shuttles will be booked on a first come, first served basis and are available to guests paying full retail for 14,000' or 18,000' tandem skydives. Our standard Chicago pick-up/drop-off point is at the University of Chicago Gleacher Center located at 450 North Cityfront Plaze Drive. Shuttles will run every Saturday & Sunday. Weekday shuttles are available for groups of 4 or more. To book, please call 815-561-3663 (option 2) and ask our Guest Relations Representative about the Skydive Shuttle. Dress for the weather that day. Wear comfortable pants, shorts or athletic wear. If it's hot, a t-shirt is just fine. If it's cold, a sweater or sweatshirt is best. If the sun is shining, it never hurts to wear sunscreen. Ladies, bring a hair tie! Please wear sneakers, or shoes that you know will stay on your feet. No sandals or open toe shoes will be allowed for tandem or Freefall University students. Please avoid boots or any shoes with large buckles or laces hooks. We will provide a jumpsuit, goggles, altimeter and gloves (if it's cold) for your jump. Please plan to leave valuables like phones, wallets, watches and jewelry in your car. We can hold your keys and hats for you on the ground during the jump. Don't jump with anything in your pockets you can't afford to lose. Absolutely no alcohol or drugs may be consumed prior to a skydive or aircraft observer ride. For the safety of you, your instructor and all our guests, you will not be permitted to board the plane unless you are sober. This is a zero tolerance policy and refunds will not be given to guests who arrive at their appointment under the influence of any substances. Every tandem skydiving guest will receive a complimentary beer or soda after their jump. You'll just have to wait to celebrate. We have a full-service restaurant and bar on-site at CSC, the Flight Deck Bar & Grill. It's very convenient to enjoy a bite to eat during your visit. With indoor and outdoor seating with a front row view of the landing area, please bring guests to enjoy the day with you and cheer you on when your parachute lands. We highly encourage you to stick around after your jump to enjoy a drink or two! Do you offer indoor skydiving near Chicago? We conduct outdoor skydiving at our facility, but we do offer indoor skydiving opportunities nearby via our partnership with iFLY Chicago Naperville, located in Naperville, IL and iFly Chicago Rosemont, located in Rosemont, IL. Our Freefall University weeknight tunnel leagues and individual coaching are available throughout the year for flyers of all skill levels. Please contact freefalluniversity@skydivecsc.com to inquire about indoor skydiving. How do you get a skydiving license? Chicagoland Skydiving Center is home to the Freefall University Skydiving School. We offer programs to take jumpers from their first tandem to becoming licensed to skydive anywhere in the world. The training program is a 25-jump comprehensive training package, resulting in a USPA A License. If you've dreamed of high fiving your friends in freefall or flying your own parachute, Freefall University is the place to start.